For the financial institution, see Ocean Bank. An ocean bank, sometimes referred to as a fishing bank or simply bank, is a part of the seabed which is shallow compared to its surrounding area, such as a shoal or the top of an underwater hill. Somewhat like continental slopes, ocean banks slopes can upwell as tidal and other flows intercept them, resulting sometimes in nutrient rich currents.[how?] Because of this, some large banks, such as Dogger Bank and the Grand Banks of Newfoundland, are among the richest fishing grounds in the world. Seamounts, by contrast, are mountains rising from the deep sea and are steeper and higher in comparison to the surrounding seabed. Examples of these are Pioneer and Guide Seamounts, west of the Farallon Islands. The Pioneer Seamount has a depth of 1,000 meters, In other cases, parts of a bank may reach above the water surface, thereby forming islands. ^ Morelock, J. (2005). Morphology. Geological Oceanography Program, University of Puerto Rico at Mayagüez (UPRM). Retrieved on: October 11, 2008. ^ a b Farallones Marine Sanctuary Association. 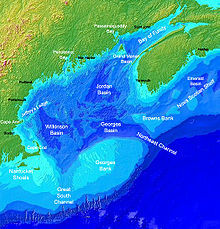 Islands, Banks & Seamounts: Geologic Features Under the Sea Archived 2006-12-15 at the Wayback Machine. ^ World Wildlife Fund. Deep sea ecology: seamounts. Retrieved on: October 11, 2008. ^ Fisheries and Oceans Canada Backgrounder: The Grand Banks and the Flemish Cap. Retrieved on: October 11, 2008. This page was last edited on 21 October 2018, at 07:07 (UTC).